We loved the walk thru the different forests, managed to see monkey's. The waterfall was beautiful and the chance to swim in its pool was awesome (water is really cold though), the mud part is more painting it on yourself rather than dipping in it, but the hot springs warm you right back up again. The guide was awesome and answered any questions the group had, and lunch was amazing. Very interesting tour. A lot of hiking but doable. tour guide could have been more attentive. We could have used a few more minutes more at the thermal springs. Great experience! Hike was very mild and more of a walk. Guide was very knowledgeable. Typical Costa Rica tour lunch buffet. Very hearty. Mud bath was very cool and highly recommended. With this tour, we adventured into the beauty of Costa Rica and had a fantastic tour. Paul, our tour guide was informative, energetic but easy going which made for a great hike. He was great with our kids, often telling stories or providing facts to teach them more. We saw snakes, spiders, monkeys, lots of birds and various spots where the volcano was evident. The park itself was not very busy so paths were not packed with people, at least not on this day. The restaurant that we had lunch at was amazing hot sauce made me take a knee and the hot springs was a great relaxing end to the day. I highly recommend a good bug spray as we did get eaten a bit by mosquitos and noseeums but aside from that, just a great trip. Thanks Viator and Thanks Paul! Freddy was a fantastic guide. We had a full day seeing the beautiful sights in Rincon de la Vieja. We started with a hike 3km on paved paths. It was a relaxed pace - not difficult at all. The hike saw several different areas around the volcano, but not the caldera itself. We then changed to swimsuits and hiked short hike to the waterfall to swim. It was a beautiful view, but the water was a bit cold! After the swim, we went to lunch at a local restaurant. There was a buffet with several options and everything was very tasty. After lunch, we drove to the hot springs area, where we painted each other with the warm mud, then rinsed it off and sat in the hot springs, which was very relaxing and a great way to end the day. I would definitely recommend this tour to anyone. Our guide was certainly very nice and was a safe driver to and from the volcano, but he didn't seem very agressive about finding birds and other wildlife for us to see. This tour was great! The description is accurate and it was a great way to spend a day of our vacation. The hike was interesting, the hot springs/mud bath was different and fun to do and the waterfall/swimming was so refreshing. I would definitely recommend this tour! After recovering from the disappointing fact that we waited at our hotel from 7:00 a.m. which was the time we were told to be ready until someone showed up at 8:00, the remainder of the tour was very good. Our guide was somewhat knowledgeable he said that before the arrival of Christopher Columbus, there were no indigenous people living in Costa Rica--which is totally inaccurate and he spotted monkeys in the trees before any of us saw them while I the jungle part of the tour. Most of the tour was spent walking on very groomed trails, some of which were actually concrete. There was a lot of wind that day in fact, there was a lot of wind most days we were in Costa Rica, so we were told not to expect much in terms of seeing wildlife. We didn't see any tropical birds, which was disappointing. After the walk through the jungle, we returned to our starting point, and from there we changed into bathing suits the only place to change was a rather dirty and tiny men's room--best to wear your swimsuit under your clothes so you don't have to use that place and we headed for a swim in a pool just under a lovely waterfall. The water was chilly, but the experience was delightful. tipico, consisting of rice and beans, fried plantain, and choice of beef, pork, or chicken. Portions were huge, with plenty left over for the young woman from England to put everyone's leftovers in two plastic containers which would provide her, she said, with enough food for the next two days. 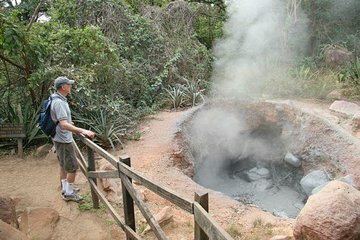 The final aspect of the tour was to head to hot springs, where we could relax in the warm to hot water, get out and paint mud from the volcano all over our exposed skin, let it dry, and then wash it off either in the river on the side of the hot springs, or an outdoor and not enclosed shower built for that purpose. On the way to the hot springs, we stopped in our tracks, because there was another occupant that got there before us. It was a boa constrictor! That was one wildlife sighting we hadn't expected. Our guide solved the impasse by picking up a large portion of a fallen branch, walking up toward the snake, putting the branch underneath it, and flipping the boa off the trail into the vegetation at the side of the trail, after which the snake slithered away and we continued our walk. There were about 10 of us in the group--a very nice size for an outing of this type. WARNING! Although the brochure indicates you should bring along water, sunscreen, insect repellent, towel, etc., our guide told us we would be fine just carrying the bottle of water he gave us. Put on insect repellent before you start the hike! We were bitten by who knows what on our legs, arms, and face. The bites didn't seem so bad at first, but it is now over a week since I noticed them, and they are still itching like crazy! This tour was fantastic. Our guide, Juan Carlos was great! He takes his job seriously and just loves nature. We saw lots of monkeys and birds and we got to swim in a waterfall! The hike is more like a walk, so don't be discouraged if you're not into actual hiking. Lunch was really good and the mud bath was a lot of fun too. It was a great way to spend the day and do a lot of things all in one tour!